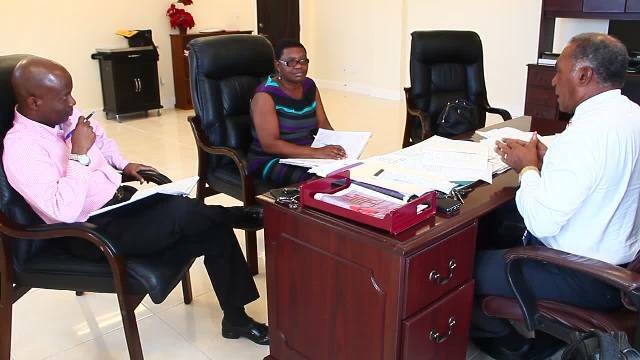 NIA CHARLESTOWN NEVIS (February 07, 2017) — Succession planning and the ongoing assessment of the school’s education system on Nevis were among the matters discussed at a meeting with Premier of Nevis and Minister of Education Hon. Vance Amory, Principal Education Officer (PEO) Palsy Wilkin and Permanent Secretary in the Ministry of Education Wakely Daniel. The meeting was held at the Premier’s office at Pinney’s on February 03, 2017. At the end of the session, Mr. Amory told the Department of Information that they have been giving deep thought to succession planning. “We are also looking very seriously at succession planning within the Ministry of Education especially the Department of Education, to ensure that we identify potential officers, educators who, we think, have the ability to move on to become education officers. “We are looking at ensuring that our education officers are not just senior educators but educators who have the capacity to help in the ongoing development of the education system, who can lead the development and offer the kind of direction which the system requires,” he said. In the area of the ongoing assessment of the education system, the Education Minister noted that they discussed how the schools were functioning and received feedback from the PEO on her assessment of the matter. Mr. Amory also spoke of his ongoing visits to schools for a first-hand look and feedback from their staff and students. He noted that his most recent visit took him to the Gingerland Secondary School one day earlier. “There are some issues there with some sanitation matters, infestation of rodents, which we have to deal with in one of the laboratories but in our visits, Mr. Daniel and myself, we were able to discuss with the principal and the deputy principal along with representatives of the Public Works Department in the Ministry of Communications and Works to ensure that we fix the problem,” he said. The Minister of Education expressed the view that, over the last three years, they had learnt that the ongoing maintenance of the school plant should not be ignored. He explained that certain adjustments and improvements have to be made, to ensure that the students get the best education possible and that those engaged in the delivery of education do their jobs to the satisfaction of the Ministry of Education and the Nevis Island Administration.